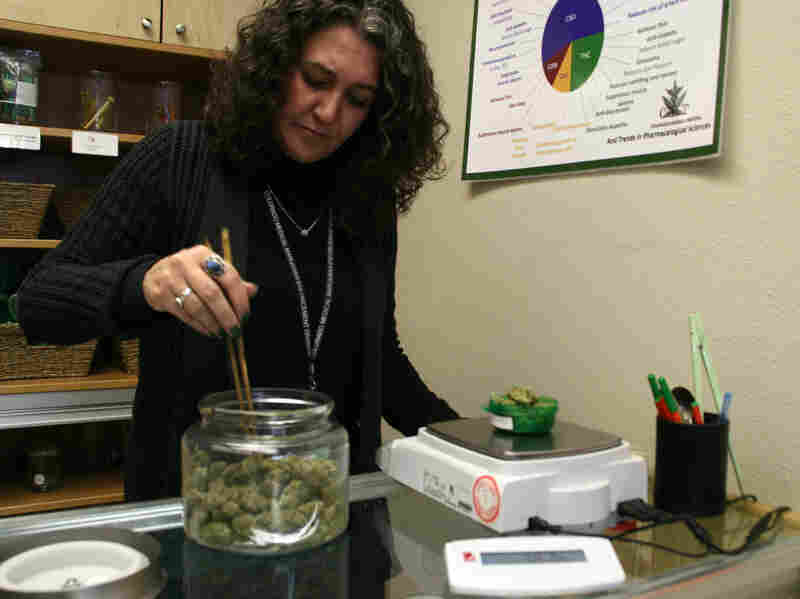 For Legal Pot Sellers, A Big Tax Problem An obscure tax provision crafted for drug dealers is giving state-licensed medical marijuana dispensaries a headache. Federal income tax rates for dispensaries in Colorado can soar to 70 percent because businesses can't claim certain deductions. It's a policy the industry is trying to change. Freeman is co-owner of Choice Organics in Fort Collins, Colo. Two tax court decisions over the past six years have sent confusing messages about which deductions the industry can make. In 2012, Freeman wrote off the costs associated with growing pot, but she didn't deduct anything related to the sale of medical marijuana like advertising costs. "We all feel like we are legitimate businesses. We have licenses ... but yet I'm still unable to write these things off and I'm still treated as an illegal business," Freeman says. Freeman says existing tax code could make Colorado's expansion to recreational marijuana use very tricky for business owners. The uncertain tax climate is the direct product of state and federal law clashing on medical marijuana policy in the 18 states where it's legal. The end result right now, according to Colorado accountant Jim Marty, is income taxes rates that are much higher compared with those paid by other small businesses. "If they were in a normal business, their top bracket would be about 45 percent. But if you have to pay tax on your gross profit and not your net income, the calculations I've done puts the federal and state income tax at about 70 percent," Marty says. The financial picture translates into some soul searching for dispensaries, Marty says. He's an accountant for 75 dispensaries in the state. Some take a conservative approach to deductions. Others are claiming all deductions as a type of protest. In true IRS fashion, Marty explains there's a form for that. "And if they chose to go down that road, we do include that form with the tax return and tell the IRS that we agree to disagree with them," Marty says. Doing that, he says, means basically expecting an IRS audit. Marty is actively working on six audits with the Internal Revenue Service. He expects at least one of his clients to challenge the IRS deduction policy in Colorado court this year. For its part, the IRS has been relatively quiet on the topic while it continues to apply the 280E tax rule to dispensaries. The agency declined interview requests for this story. The silence has been frustrating to San Francisco attorney Henry Wykowski, an expert on the topic. "This is inherently unfair," Wykowski says. Wykowski has represented sellers in the two existing court cases that provide the only guideposts on how the law applies to dispensaries. And the results have been mixed. He says he's repeatedly sought more specific guidelines from the IRS but has come up short. "It punishes the dispensary owners who are trying to comply with the law and rewards those that ignore their obligation to file tax returns," he says. In the meantime, Colorado dispensary owner Freeman says she'll continue to meet all her tax obligations. But she says a fix is desperately needed. "Those people that 280E was written for didn't have a license hanging on their wall from the state of Colorado that says you are legal to do business," Freeman says. Medical or recreational marijuana use is now legal in one-third of all states. The legal limbo can be resolved by either Congress or the courts. Until then, dispensary owners will have one more reason to dread income tax day.